Vestibular syndrome refers to a group of diseases that affect the balance system (also known as the vestibular system). Common signs of vestibular syndrome in dogs and cats include loss of balance, falling, rolling over, abnormal flickering of the eyes and general wobbliness. The vestibular system controls balance and tries to prevent the animal falling over. Like the other senses, the balance system consists of sensors (located deep inside the ear in the inner ear) and a specialised control centre (located at the back of the brain). Control of balance requires tiny changes in the position and movement of the body and the eyes depending on the position and movement of the head. The balance sensors detect the position of the head in space while the animal is standing at rest or when it is moving. The information on the position of the head is converted into electrical signals which are sent to the brain. The balance control centre in the brain processes this information and sends messages to the rest of the body to keep the animal upright. Messages are also sent to the muscles controlling movement of the eyes to change the position of the eyes according to the position of the head. What are the signs of vestibular syndrome in dogs and cats? Common signs of vestibular syndrome in dogs and cats include falling, head tilt (rotation of the head with one ear held lower than the other), flickering of the eyeball from side-to-side or up and down (nystagmus), general wobbliness (often with the animal drifting to one side as he moves around) and/or circling. The balance centre is very close to the area of the brain that controls vomiting and so animals with disturbances to the vestibular system may also feel nauseous or be sick. The balance sensors are close to the hearing sensors in the ear and the nerves controlling the movement of the eyelids, lips and ears. This means that diseases affecting the vestibular system may also cause loss of hearing and a drooping of the muscles in the face (facial paralysis – for more information see our Facial Paralysis Fact Sheet). Similarly, diseases affecting the balance centre in the brain can also affect other parts of the brain causing seizures, weakness, loss of vision, or difficulty eating and drinking. What can cause vestibular syndrome? Vestibular syndrome in dogs and cats can be caused by a disease affecting any part of the system (sensors within the ear, the nerve connecting the ear and brain, or the control centre in the brain). Conditions affecting the ear include deep ear infections (otitis), ear tumours or polyps, damage to the skull such as caused by a road traffic accident or a bad fall. Diseases affecting the vestibular nerve include nerve tumours, nerve inflammation (neuritis) or an under-active thyroid gland. The brain can be affected by a tumour, inflammation or infection (encephalitis), stroke, head trauma, some vitamin deficiencies (thiamine deficiency) or a malformation of the brain such as a cyst. Some antibiotic treatments can also cause vestibular syndrome in a small number of “sensitive” dogs. Some animals (particularly aged dogs or cats) develop vestibular syndrome and yet no cause can be detected, despite extensive investigations. This is called idiopathic vestibular disease. Your vet may suspect that your pet has vestibular syndrome from your description of its symptoms. However, there are several other diseases that can cause similar symptoms so it is important to try to confirm the presence of a vestibular syndrome in dogs and cats and then to identify its cause in individual patients. Your vet will perform a neurological examination to determine if the problem is more likely to be within the ear or the brain (refer to our Neurological Examination Fact Sheet for more information). The ear should be examined with a scope and a swab taken if an infection is suspected. Many dogs with vestibular syndrome may have no typical signs of ear inflammation such as head shaking, scratching of the ear, inflamed ear canal or inflamed eardrum. Other investigations such as X-rays, CT scans, or best of all MRI scans can help to detect disease located behind the eardrum such as a deep ear infection or a tumour. CT and MRI scans of the brain are also useful for detection of brain disease. Your vet may also want to collect a sample of the fluid that bathes the brain and spinal cord (CSF) for further tests. You can refer to our Neuro-Diagnostic Tests Fact Sheet for more information about the different types of tests. How can vestibular syndrome in dogs and cats be treated? If an underlying cause can be identified and treated the signs of vestibular disease should get better. If irreversible damage to the balance sensors has occurred then head tilt and/or an intermittent loss of balance may persist despite adequate treatment. In animals with significant nausea and loss of balance, drugs used to control motion sickness may help reduce symptoms, but treatment of the underlying condition is also required. If my dog has vestibular disease will he get better? 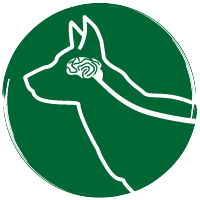 For dogs where the cause of vestibular syndrome has been identified, the outlook depends on what the underlying cause is. Some infections can be controlled quite easily whilst others are more serious, the prognosis is worse if the animal is found to have a tumour. In most cases where no underlying cause is found animals will recover without any treatment. This recovery may take months and in some cases the animal may be left with a permanent head tilt.